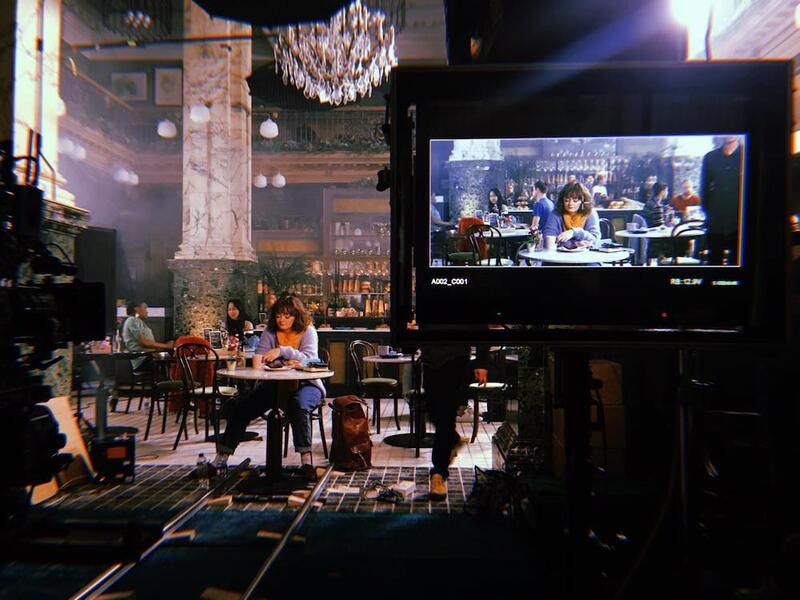 In director Bethan Seller‘s latest work for the Royal Bank of Scotland, an ordinary cafe becomes the stage for one daydreamer’s jazz-hands fantasy world. Created with production company Greenroom Films and newly pledged agency The Leith Agency, who are the first Scottish agency to commit to the Free The Bid pledge, Bethan takes viewers into the mind of her main character, Sophie, as she envisions climbing up on a table and belting out a rendition of Lady Marmalade. 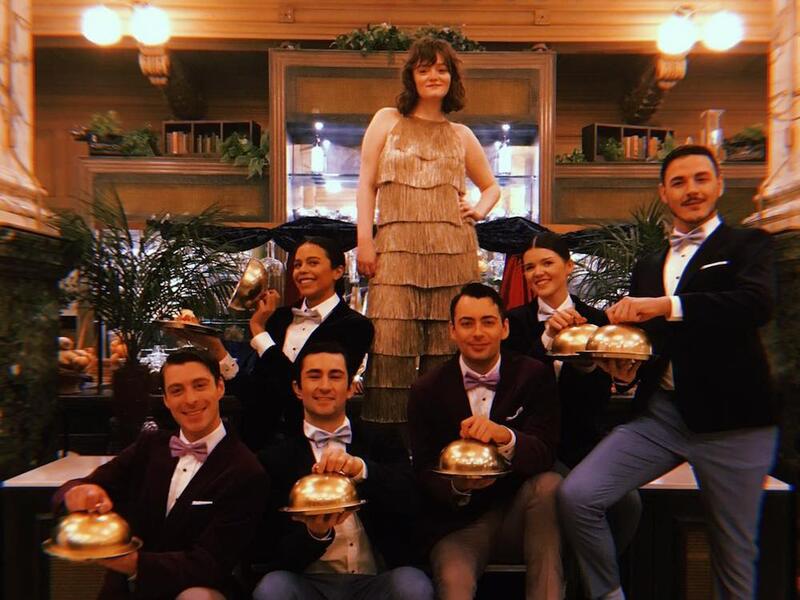 Bethan’s assured comedic tone and visual style effortlessly transition the scene from a quiet restaurant to a lavish performance (complete with a gold fringed bodysuit, cake-bearing waiters, and a magical flying scarf), before plunking Sophie back to reality. We wish all daydreams could be this fun! 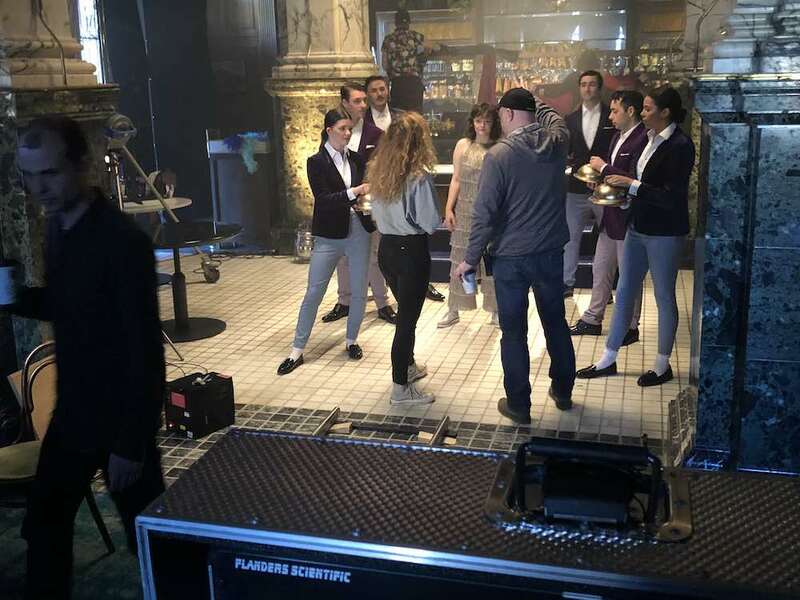 We spoke with Bethan about drawing inspiration from the showbiz glitz of “Chicago,” the tight choreography and timing required for getting one-take shots juuust right, and creating work that pushes at the boundaries between real life and fantasy. Your spot for the Royal Bank of Scotland starts in the real world, but veers off into a fun fantasy scenario. What elements of this brief excited you most from the get-go? How did you and the agency work together to bring the vision for this spot to life? I worked with Leith Agency in Edinburgh for this spot. It’s the first time I’ve worked with them, and it was a fab experience. They were really collaborative and we shared the same vision immediately, which made the process very smooth indeed. Were you excited to have the chance to shoot such a comedic spot? I was! I had a bit of a childhood dream that one day I’d have my own sketch show. I used to entertain my parents and their friends at dinner parties by doing my best impersonations of TV sketch show characters of the era. 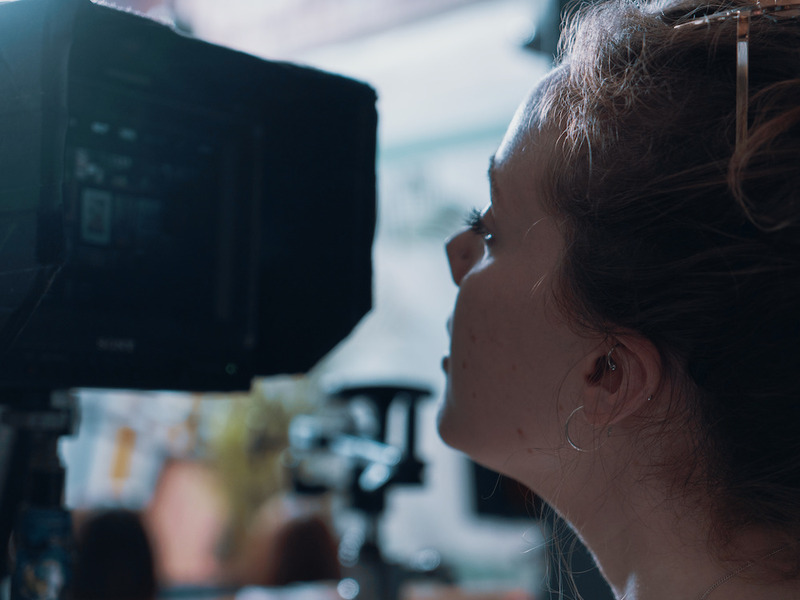 Now I’m the other side of the camera, I love making work of a playful nature – light-hearted scripts where the cast and characters don’t take themselves too seriously (and, if I’m really lucky, some eye-candy-art-direction thrown in for good measure!) This script was the whole package. How does humor play into your work usually? Commercially, I try and weave it in where it’s called for. In the past, I’ve generally worked on scripts that aren’t dialogue based, and because of this, I’ve naturally been drawn to casting people who can bring a comedic performance with their facial expressions and mannerisms alone. When the casting briefs are open, like this one was, I love steering away from a typical commercial look, and writing in characters who are a bit more human. This spot has such a well-defined color palette. What were some of your inspirations for the spot’s aesthetic? The café scene, on the other hand, is a little more set within the real world. My starting point for inspiration was the cafe in Amelie, but I ended up veering towards a cleaner, less stylized grade, with a definite blue hue in the shadows to point us in the direction of The Royal Bank of Scotland’s brand palette. These rich blues and purples are also woven throughout the uniforms of the waiters in the dream scene, but are graded with warmth. The contrast of palettes between the two scenes was something I was wanted to ham up enough for the transition into Sophie’s fabulously opulent daydream to be really clear. The last main thing was that the whole piece had a deliciously rich, cinematic feel about it. How did you and your crew approach creating the tightly composed shots utilized throughout the piece? Once I’d written the shot list, it became clear that, with only 4 shots to film and a relatively straightforward edit, a lot of the magic would be captured in-camera after a lot of rehearsal and re-takes. Each shot came with its own timing challenges and unique technical hurdles. The daydream sequence was probably the shot with the most to think about – a spotlight reveal, followed by a magical(/fishing wired) flying scarf (look again if you missed it! ), and a simultaneous jib down and track back on camera, while the rest of the house lights came up. This is all while 6 waiters reveal their desserts in synchronization, as Leah saunters down some steps and through the middle of the waiters to reach a specially built “camera shelf” where she could take her very specific “daydream position” ready for the match cut (and the confetti explosion, of which we had a limited number of cannons!). Just to add a bit of drama, this all had to unfold within 8 seconds, so our producer Lucy was ruthlessly stop-watching the entire process and culling any shots that went over. As you can imagine, the general rule of thumb all day was rehearse, rehearse, rehearse! Were there any specific visual cues employed to clearly differentiate between the “real world” and your protagonist’s Lady Marmalade fantasy? I also wanted to ensure there was an audible clue to help the transition, and those 7 magical upward chiming notes do the job perfectly. What kind of direction did you give your actors on set, in order to capture the performances you were looking for? What are your favorite elements about the final piece? One of my favorite elements is the match cut. I think we really encompassed visually and audibly that moment when you snap out of a daydream and back into your surroundings. I also love the choreographed lifting of the golden cloches revealing those tasty puddings, timed with the track and jib of the camera. Isn’t it nice when a plan comes together? You’ve worked across genres in your commercial work; are there any kinds of stories you find yourself drawn to telling, in either your commercial or personal projects? I’ve found myself drawn to characters and stories that are a little larger than life. It’s funny that a lot of the short film scripts I’d been writing recently also revolve around a central character getting lost in a daydream! I also love the opportunity to explore the boundaries of “real life,” particularly when it comes to art direction. The sets I love to create are either romantic, filmic ideas of a location, or are stylized to the point where they’re just on the edge of ‘passable,’ in terms of sitting within reality. Finally, what can we expect next from you? My thing at the moment is choreographed movement and dance. I have a few ads I’m working on – which are coming out very soon – that are more explosive color bombs filled with playful performances and dance. I’m also trying to find the perfect track to use to accompany a dance film I’ve been devising with a Movement Director over here in Manchester – I’ll get my teeth into that once work’s slowed down a bit! I’m also hoping to get a couple of music videos under my belt, as well as some short comedy sketches (not with me in them this time…!) at some point. I have bags of ideas and it’s all very exciting, which makes it quite tricky to focus on one thing!